Job hunters no longer have to subject themselves to a lifetime of trudging into an office, but can instead opt for a better work-life balance through temp and contract work. NEW YORK (MainStreet) — Unemployed Americans desperately sending out resumes to find a full-time job or or those who want a position that is flexible and fits their scheduling demands might want to consider another route: becoming a temp or contract worker. According to a new report issued by the job placement company CareerBuilder, companies are planning to go on a temp worker hiring binge with almost half of all firms planning to sign on contract workers this year. This movement is not an outlier, but rather part of an on-going trend that will see the number of people employed as a temp or contract worker increase by 3% this year, compared to 2014 -- a 75,000 worker gain. This trend will continue through 2019. "Barring any type of economic catastrophe, we expect temp job service to improve and do well for the foreseeable future," said Steve Armstrong, senior vice president for U.S. operations at employment agency Kelly Services. "Following a recession, temp jobs are typically among the first to return," said Ryan Hunt, a career senior adviser at CareerBuilder. "From 2009 to 2010, most companies were hesitant to add full-time headcount in large numbers and many chose to rely on a temporary or contingent workforce in response to increased demand. 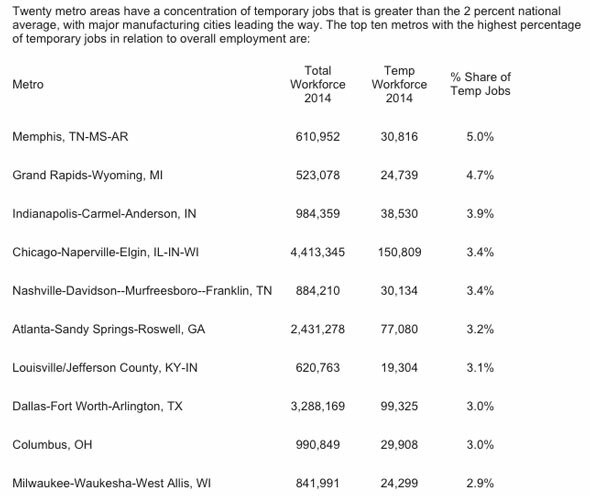 Our annual forecast suggests that many of these roles are transitioned to full-time, permanent jobs." Armstrong pointed to a number of factors that are lending weight to the growing use of temp workers by corporations along with their growing popularity among workers. For starters, companies are relying on "just in time" delivery, whereby they need to staff up to complete a specific product run and then scale down. That's most efficiently handled by a temp workforce with very specific capabilities to work on a particular project. To boot, the digital nature of a lot of jobs -- allowing for telecommuting and flexibility -- has shifted what people value. As a result, increasing numbers of people entering the job market have different expectations on how they want to conduct their professional lives. Instead of chat at the water cooler before returning to their cubicles, they're happy to work remotely with a computer -- in boxers on the couch. "The nature of work has changed," Armstrong said. "The idea was you had to go to a building to work. The people entering the work force now have significant expectations. Their thinking is not tied to the company, but to the work, and they care more about how they are allowed to accomplish it and they want to be flexible." A report issued by Deloitte in February stated the challenges presented by the on-demand workforce are significant. But the trend itself seems irreversible, driven by the networked nature of work, the multigenerational workforce, a desire for more flexible working conditions and the demands of business. Researchers estimate that as many as 30% to 40% of all U.S. workers today are contingent. In fact 51% of employers in the Deloitte survey report that their need for contingent workers will continue to grow over the next three to five years. One of the challenges is communication. Dealing with a multigenerational workforce is another factor companies must overcome. Baby Boomers, Gen X and Millennials all require different levels of communication, so company management must take this into account when attempting to hire and retain workers. Older employees tend to prefer periodic face-to-face or verbal interaction, while younger people demand a higher level of contact, but through a digital interface like email or texting. Still, Kelly sees the temp job growth coming in much more advanced fields. Armstrong said that those in credentialed fields like IT, science and engineering professionals are highly desirable as temp and contract workers. Also expected to be in demand are those involved in the skills trade like machinists and those who can operate computer numerical control machines. 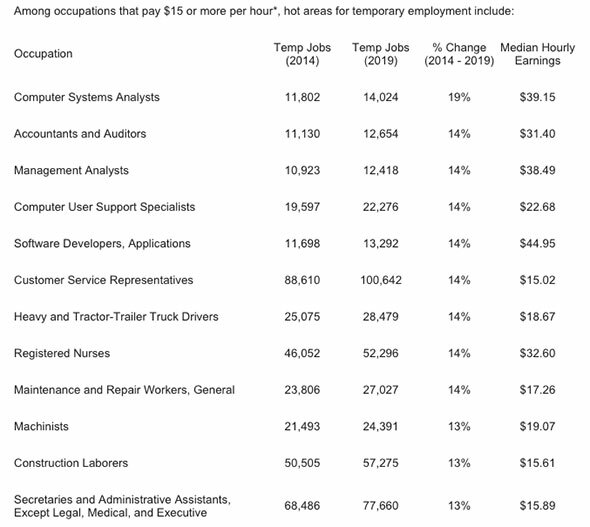 CareerBuilder agreed, noting the fastest growing occupations paying more than $15 per hour were computer systems analysts, accountants and management analysts, all of which paid $38 per hour or higher. The social media site LinkedIn noted that more than 7,000 of the positions listed on its job board have the word temporary in the title, a solid indicator that temporary assignments are important to all types of companies. The fact that professionals themselves are now seeking temp positions is indicative of the change in attitude toward this type of work. Taking temp work was once simply a way to earn money when a person found themselves in between a "real" job, but no more. "The stigma is pretty much gone," Armstrong said. "We now feel workers are coming to Kelly for us to be their employment advocate to get not just their next job, but their next six."